This morning I treated my daughter to the smell of freshly baking bread. Don’t I sound like a brilliant mother? Can’t you just picture a Mad Men vision of pinafore and pearls, oven mitts at the ready? Well, don’t be too impressed because it was actually due to neglect on my part. When Mr A left for work I noticed the bread bin was open – empty, save for a forlorn wrap bread of unknown vintage. On the countertop there was no sign of a plate, lidless jam jar, or butter-smeared knife – universal man-signs indicating the finishing off of bread. Super-sleuth me realised that Mr A probably went out the door with just a bit of fruit for his breakfast as there was also no soya or dairy milk (ruling out cereal). As Mr A often doesn’t have time for more than a five-minute lunch (I am not exaggerating) I was feeling very guilty. In mitigation I’m neither a bread or cereal person in the morning so can be completely unaware when things reach crisis point, such as today. 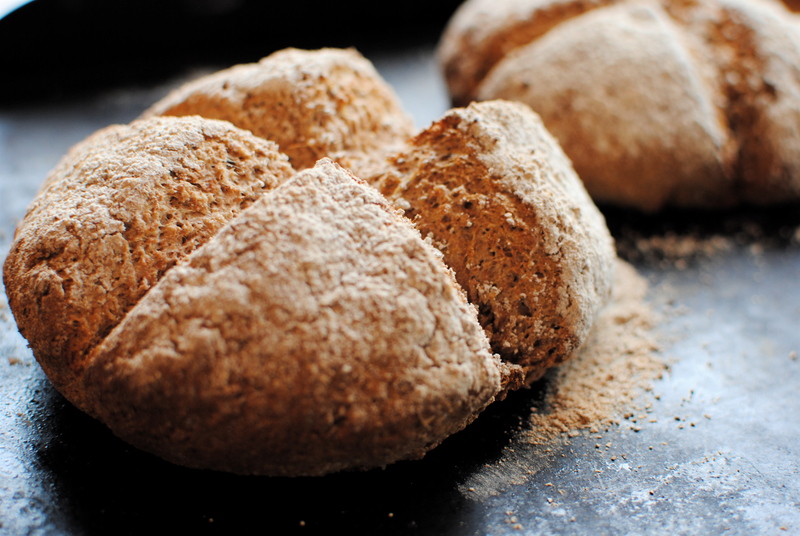 Short of zooming out to a shop, pre-shower/pre-face, the only thing for it was to make some bread, a quick, delicious soda bread. Although this was not going to assuage the guilt at my 6’1” husband facing the day with a ‘fun-size’ banana, at least Miss R wasn’t going to go hungry. Or me for that matter. 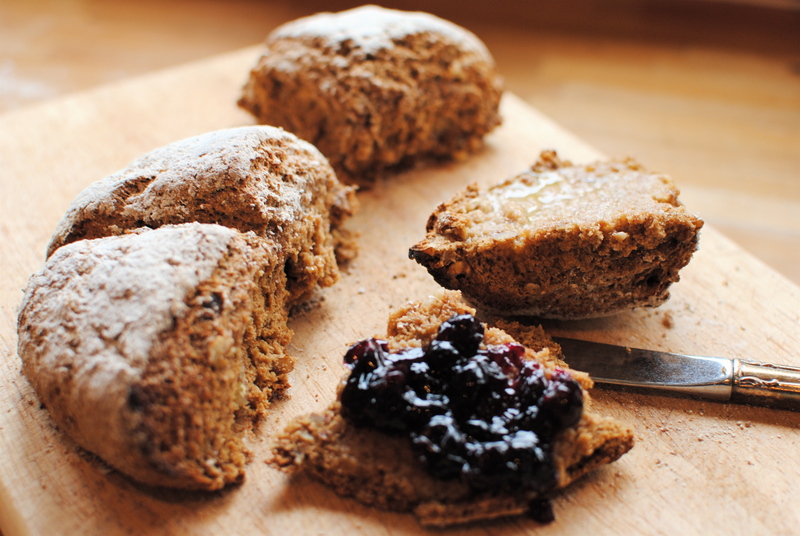 Soda bread is the saviour of the neglectful mother/wife, but it is more frequently made because it is truly delicious, very adaptable and quick. If you have all of the ingredients to hand you can be eating bread in about 40 minutes, which by bread standards is practically light speed (I am conveniently forgetting pan-cooked flatbreads). The reason it is so quick is because you use baking soda instead of yeast, so no rising time. It’s also not a fussy bread so you can feel free to adapt the recipe to your taste: I often add a good handful of toasted seeds, like caraway, linseeds and sunflower seeds. And you can use any milk too – goats’, soy, dairy, buttermilk or even watered down yogurt. 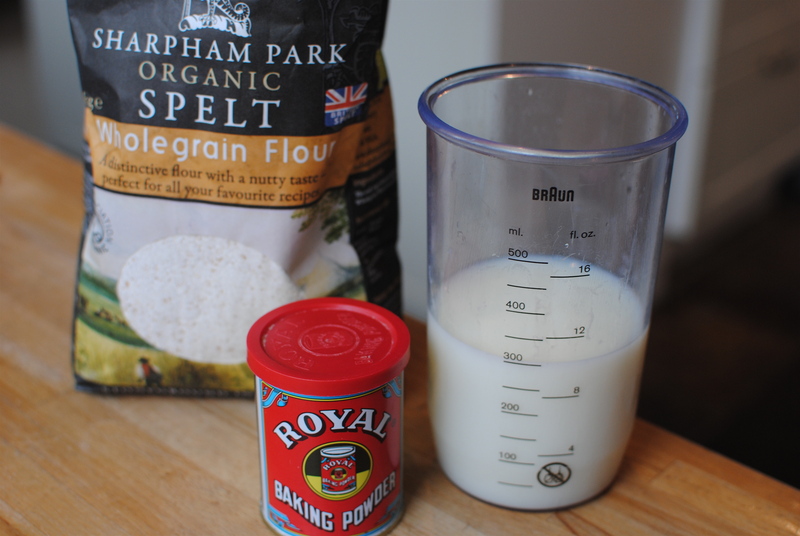 Believe it or not I did have buttermilk (which, I suppose, would not have been nice with muesli) so that’s what I used, but I sometimes use yogurt or skimmed milk with reliable results. Use this recipe as a guide: keep the basic ‘bready’ elements but please freestyle with the flavourings. The only two caveats are that you probably shouldn’t go over 100 grams with the added bits, and that because the bread is yeast-free it also doesn’t keep well. The reason I have titled this post ‘Two Soda Breads’ is because I have done one for breakfast time (nutty and sweet) and one for a soupy supper or lunch (plain). Have a quarter of each and either share the rest or eat it warm over a day or two – lovely sliced and popped under the grill/broiler. 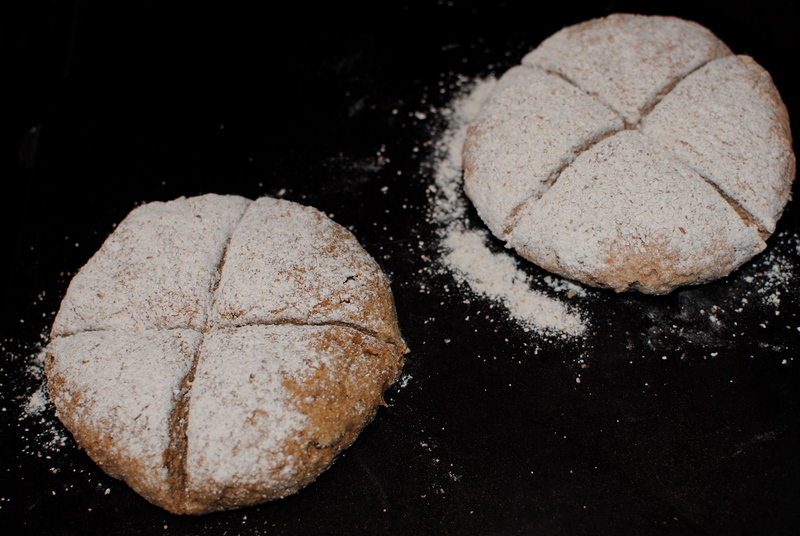 Most soda breads are very similar. I make a number of different types, including an all oat and an all rye one, but today I offer the most popular and most adaptable recipe, with a sweeter ‘breakfast’ version. If you are ever hanker for fresh bread but have neither the time, energy, or for that matter, yeast, this is the bread for you. Heat the oven to 200C/400F. Stir together the dry ingredients in a large bowl and mix in the buttermilk to make a soft, sticky dough. With floured hands gently knead the dough a few times before patting into a ball and flattening into a 5 cm thick disc. Flour the disc generously and place on a baking tray. Cut a cross (or make 6 wedges) into the bread, going almost all the way through. Pop the tray into the heated oven and bake for 25-30 minutes. It’s done when the bread sounds hollow when the base is tapped. Cool for a few minutes on a wire rack before tearing open and eating with gusto. As above but add 75g/2.64 oz chopped, lightly toasted walnuts to the dry mix and 1 heaped tablespoon of blackstrap molasses (from health food stores in the UK) or dark treacle to warmed buttermilk.